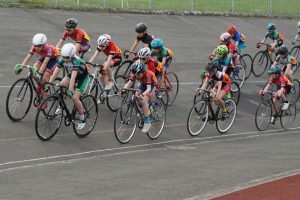 On Saturday the Welwyn Wheelers hosted Round 2 of the London Youth Track Omnium series at Gosling Sports. A massive entry of 138 riders had entered for the event covering the under 16, under 14, under 12 and under 10 age groups with each group competing in five cycle race disciplines. Racing in the under 16 group was incredible fast and was dominated by the Team Corley – Ethan Vernon and Theo Modell taking the top two places overall. Wheelers Will Raymond put in a strong series and finished in 4th spot in the 30+ field. Tom Durkin was 14, Sam Asker 15th, Nathan Blackmore 22nd and Joe Bennett 26th. The under 16 girls proved to be a battle between Millie Gage, Josie Griffin and Alice Matravers who won the first Omnium at the Olympic park. After the completion of the five events it was Alice Matravers, followed by Josie Griffin and Millie Gage to take the top three podium places. Wheelers Lauren Higham and Elspeth Grace were 8th and 12th. Eleanor McCardle was 14th. In the strong under 14 category Olli Stockwell was in contention throughout and finished 5th with Tom Sharples 19th and Michael Sumner 25th. VC Londres took the top three podium places Imogen Chastell rode in the under 14 girls events and was pleased with her 5th place overall with a series of positive performances Euan Woodliffe was on good form in the large under 12 boys category – he won the one lap time trial by two seconds and followed up with top places in the remaining events to finish in second place overall. Max Jackson was 12th and Toby Brown 20th. In the under 10 category Dylan Starkey 4th, Rupert Cavill 9th and Fin Woodliffe 10th. A tough day for both the riders and the Wheelers race team in the hot conditions with the race programme lasting over 6 hours. A well organised and successful event run by a strong team. 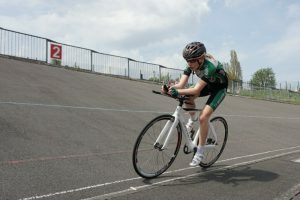 The following day Round 3 of the Omnium was held at the newly re-opened Preston park track in Brighton however a number of riders opted out two days of competitive racing plus the travel and the entry list was less than the record numbers at the Welwyn event. (5 riders had entered the event but only 77 riders raced in the Omnium. Six Welwyn riders travelled to the third round of the Youth Omnium Series . Racing was run in perfect conditions and four Welwyn riders secured podium positions on another highly competitive days racing. Leading the way was Josie Griffin taking second in the U16 Girls category with strong Devil, Scratch and Points races. Millie Gage was 10th U16 Girl. Imogen Chastell was third U14 Girl, strong Scratch, Sprint and Points performances securing her a podium place. William Raymond was also third in the U16 Boys Category, with good Devil and Sprint placings backed by a good Points race..
Sam Asker also impressed to finish tenth in the U16 boys, with seventh place in the Scratch race the highlight. In the U12 Category Euan Woodliffe continued his impressive form to take second place. His fastest category Time Trial time of the day was followed by fine performances in the Scratch and the Sprint.